As I wrote a few weeks back, in my review of “Jim Henson: The Biography”, I’ve been a huge fan of Henson and The Muppets since I was a wee kidlet. I still remember the first time I saw “The Muppet Movie” and how amazing it was that The Muppets were on the big screen. We even watch “A Muppet Christmas Carol” every Christmas, without fail. So, it was with no small amount of excitement that I brought the family to this screening, planning to introduce the next generation to the wonder of The Muppets writ large. The plot of this film revolves around The Muppets needing the next thing to do following finishing a movie. They’re slyly coerced into going on a world tour by the smooth operator, Dominic Badguy (Ricky Gervais of “Extras” and “Derek”). Badguy – who reassures them that the proper pronunciation is “Badge-e” (It’s French, he coos across the table) – is a tour manager who wants to take The Muppets across the Pond to perform in some of Europe’s most famous cities. Coincident with their agreement, the scene changes to a gulag in frozen Siberia, where an evil character is set to make his escape. Constantine, the world’s most wanted villain, is a dead ringer for Kermit (except for a mole on the right side of his face), and he busts out of the Russian joint courtesy of a stockpile of explosives. Not long after, he connects with Dominic and makes plans to meet up with him in Berlin. While the tour spins up and Kermit books them into a series of fleabag, run-down theatres, The Muppets begin to look more and more to Dominic for leadership and a more glamorous experience. Dominic encourages a despondent Kermit to take a calming walk in dense fog (oh, sure), where he’s ambushed by Constantine – who’s armed with a fake mole and some industrial-strength glue. 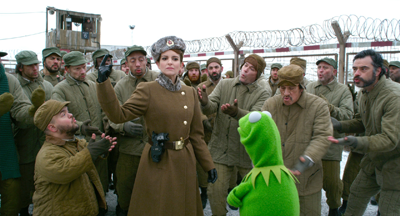 Kermit is immediately nabbed by the German police, who conveniently deliver him directly to the gulag, into the control of Nadya (Tina Fey of “Saturday Night Live” and “30 Rock”). And thus, the plot splits in two: one track follows Kermit (who Nadya reluctantly accepts as not Constantine), while he waits patiently for his friends to rescue him from the gulag; one track follows The Muppets, with Constantine and Dominic pulling off heist after heist, as they gather the pieces needed to steal Britain’s Crown Jewels, tucked away in The Tower of London, always one step ahead of the buddy cop pairing of Interpol’s Jean Pierre Napoleon (Ty Burrell of “Modern Family” and “Mr. Peabody & Sherman”) and the CIA’s Sam the Eagle. As one comes to expect from Muppet movies, there’s quite a bit of song-and-dance action by both Muppets and humans. These range from the sinister (a gloating Constantine singing “I’m Number One”, accompanied by Dominic glumly agreeing to his “Number Two” status) to the steamy (Constantine soulfully seducing Miss Piggy with “I’ll Get You What You Want”) to the downright silly (the gulag inmates warming up to “I Hope I Get It” from “A Chorus Line”, as they audition for the gulag’s annual talent show). The songs are generally okay, but few are memorable enough to make me suggest rushing right out for the soundtrack. For whatever it’s worth, the humans hold up their end of the singing bargain against tough competition; Gervais and Fey show off decent singing chops that nicely complement their well-toned comedic muscles. In general, I really wanted to love this movie – but I came away with the feeling that it was trying too hard. Clocking in at just under two hours, it runs a good 20 minutes longer than most small kids’ attention spans – and that brings me to my other concern. While Henson apparently struggled against the public perception that The Muppets were just for kids, this movie is clearly being marketed to young children. I took both of my kids – my 7yo daughter and 4-1/2yo son. My daughter generally liked the film, but the explosions and violence were off-putting for her. The reaction from my son was more visceral; by the time the film reached its climactic scene, he was in tears, snuggled up against me for comfort. So, as the question inevitably comes up as to whether “MUPPETS MOST WANTED” is good for kids, my answer would be that it depends greatly upon the age of the child in question and their comfort level with violence or “action”. This is much the same problem I had with “Cars 2”, which was a spy film disguised as a kiddie film. 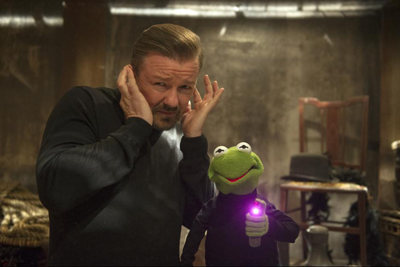 That’s not to say that “MUPPETS MOST WANTED” was over-the-top with the explosions or the guns from an adult perspective; Henson loved explosions, so there are definitely scenes in this that he surely would have loved. On the other hand, marketing this film to young kids presupposes that it’s okay for them to watch…and that’s really very subjective. It all depends on the particular child’s tolerance for violence/action (which, in my son’s case, is really low). 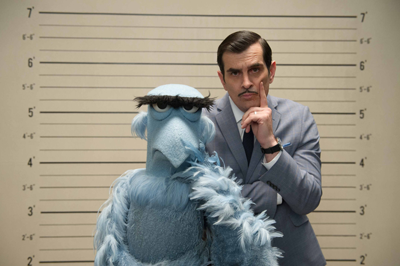 On the plus side, “MUPPETS MOST WANTED” delivers the requisite cameos (too many to name without ruining the surprise), bad puns, and some really terrific movie tributes – including “The Shawshank Redemption” and “Moonraker”. In many ways, it’s a really cute film, but it runs a bit long in the name of trying to maximize all the usual gags. It’s also a bit unbelievable that The Muppets, who know Kermit so well, would somehow fail to notice that their fearless leader now sports an Eastern European accent and a permanent sneer. But, so what if things aren’t always fully baked? The Muppets continue to entertain, and their human counterparts hold up their end of the bargain. Consider it cute, light entertainment for adults and a mixed bag for kiddos, especially once you get below 8-10yo. 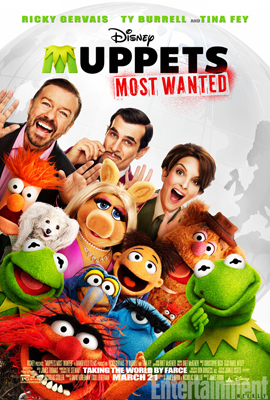 “MUPPETS MOST WANTED” opens nationwide on March 21, 2014. This movie is rated PG for some mild action. This entry was posted in movie reviews and tagged constantine, disney, movie review, Muppets, muppets most wanted, ricky gervais, tina fey, ty burrell by crunchymetromom. Bookmark the permalink.